Mississauga – Upon being elected to office, I committed to tackling challenges surrounding youth unemployment. The Mayor’s Youth Employment Expo is part of the agenda to help youth reach higher, Mayor Crombie said today during the Mayor’s Youth Employment Expo which took place at City Hall. Over 70 different public and private-sector, non-profit, post-secondary and government organizations were on hand, including The Greater Toronto Airports Authority, Trillium Health Partners, Scotiabank and the Toronto Scottish Regiment – the Army Reserve regiment for Mississauga. “Research has shown that a strong network and connection to mentors can open doors for youth as they transition into the workforce. 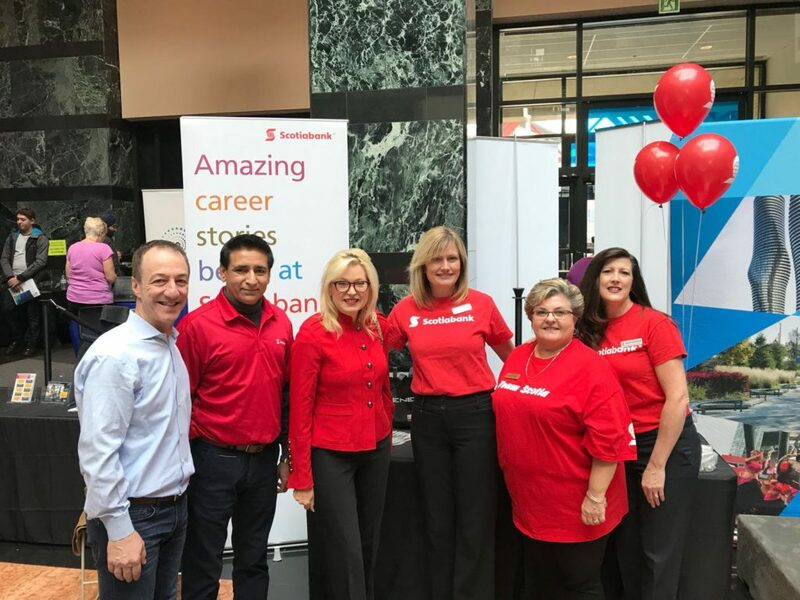 These role models provide important support both in navigating the job market as well as helping youth understand the skills and experience required to succeed,” said Mayor Crombie. “Many youth face multiple barriers including slow-job growth economies, low-quality jobs, skills mismatch and social discrimination, among others. We must do everything we can to support local youth to pursue their passions, find employment opportunities and achieve their career aspirations”, Mayor Crombie added. New this year, the Mayor’s Youth Employment Expo also featured workshops designed to help youth build and develop networking, resume-writing and interview preparation skills. LinkedIn, Magnet and the Centre for Education and Training led these workshops before youth met with employers. “Networking in the 21st century is more important than ever. Leveraging social media empowers you to build and reach a network in ways not before possible,” said Perry Monaco, Head of Customer Success Canada at LinkedIn. Mayor Crombie acknowledged the support of a number of community organizations who promoted and participate in the Youth Expo, including the Mississauga Board of Trade; the Malton Business Improvement Area (BIA); the Streetsville BIA; the Port Credit BIA; and the Clarkson BIA. The Mayor’s Youth Employment Expo is part of a larger agenda to make inroads to help youth reach higher. As part of the agenda, the Mayor also launched the Mayor’s Youth Speaker Series last year with guest speaker, award-winning journalist Amanda Lang. “Our Speaker Series is an ongoing series of keynote discussions featuring prominent Canadians from different sectors, aimed at inspiring youth, and providing them with guidance as they prepare to enter the workforce,” said Mayor Crombie. Mayor Crombie is set to host the second annual Mayor’s Youth Speaker Series with this coming Wednesday, November 22. This year’s speaker series will feature special guest Dr. Patrick Gunning. Dr. Gunning is a world-class researcher, scientist and entrepreneur who also serves as Canada Research Chair in Medical Chemistry Professor, Department of Chemical & Physical Sciences University of Toronto Mississauga. The event will take place from 7-9PM at UTM’s Instructional Centre Building. Space is limited and registration is mandatory at www.youthspeakerseries.ca. This entry was posted in Carousel News, Mayor's Initiatives, Mayor’s Youth Jobs Initiative, News. Bookmark the permalink.